Keeping your lawn properly watered and in optimal shape requires a functioning sprinkler system. In the Boise, ID area, Aloha Lawn, Tree & Pest is your premier sprinkler repair and servicing landscape company. A thick lawn is the best defense against weeds and high temperatures that tend to dry out and kill your grass. Our team can repair your broken and malfunctioning watering system regardless of if we initially installed them. We service manual, automatic, above ground and below ground sprinklers. If your system is beyond repair or if you have a newly landscaped yard without a watering system in place, our sprinkler contractors can install a new set of sprinklers for you. 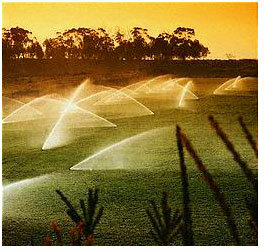 We specialize in designing layouts to fit your yard and watering needs for optimal coverage, minimizing wasted water. We have engineered an efficient drip irrigation system that saves you time, money and resources. Drip irrigation distributes water to the root-zone of the plants. Unlike trench and bed sprinklers, our watering system causes no disruption the area and can be installed on hills and slopes. This strategic placement mitigates excessive runoff, allowing for difficult areas to be watered with ease. 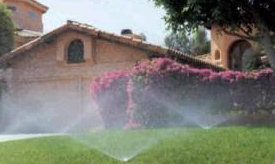 As your lawn sprinklers work at optimal capacity, your landscape remains healthy and green. If you are ready to upgrade your existing system or you have never had sprinklers, call Aloha. Trust our team to design and install a new, water-efficient system. We stand behind our new sprinkler installations as well as our existing work with a reliable service agreement. Large yard and farmland irrigation systems require maintenance, so they work as they should. Aloha Lawn, Tree & Pest provides sprinkler system maintenance as part of our landscaping options. Our technicians can adequately repair, service and maintain systems of any size or scope. So, whether your system is residential, commercial or farmland, we can service it. For any of your sprinkler system needs, call Aloha Lawn, Tree & Pest. We are Boise’s premier landscape and sprinkler servicing company. To speak to a team member, please call, 208-322-9069.